These giant tulle covered balloons have been a long time in the making! I have experimented with tulle and balloons before without luck; despite being lightweight the tulle sinks the balloon. The trick? You need a massive balloon! 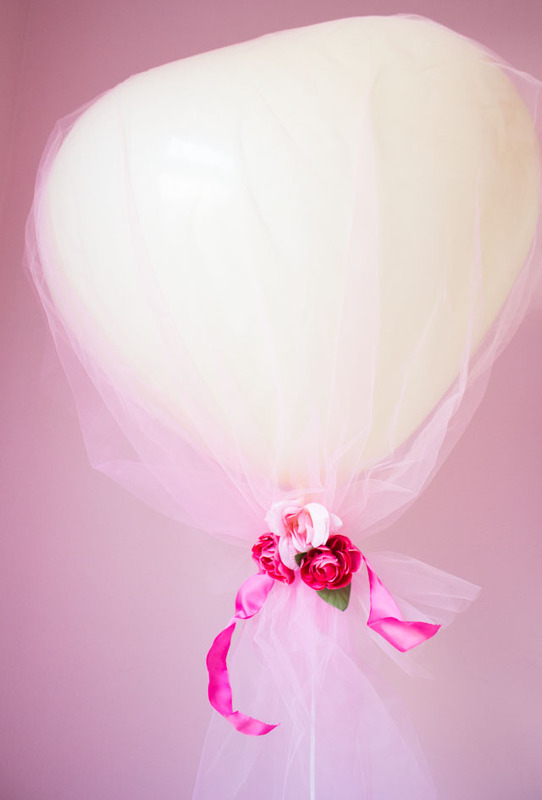 At least 36″ like this heart balloon to keep the tulle afloat with helium. But the results sure are pretty and would be perfect for a wedding, shower, or Valentine’s Day decor! There is a little backstory to today’s project. 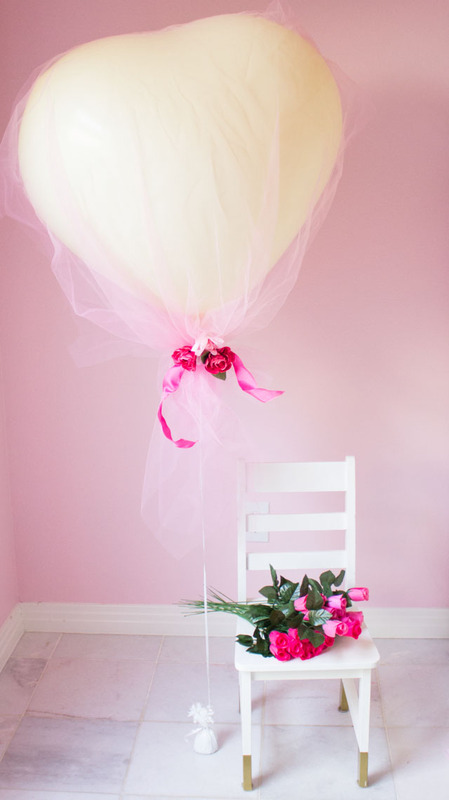 A couple years ago someone pinned this photo of tulle covered balloons and linked it to my pom-pom balloon post. Why, I have no idea. Well, people repinned it like crazy and pretty soon I had all these comments on my blog asking where to find the tulle covered balloon tutorial!! I searched and searched for the original source of the balloons to no avail. So I eventually tried to make my own. Since my first attempt with a 20″ balloon failed, I thought I would try again with this 36″ heart balloon left over from my “heart attack” balloons for Oriental Trading. This time it worked! 36″ latex balloons (You can use heart-shaped or round balloons. I used these white heart balloons from Oriental Trading) Note: you could also try 36″ mylar balloons. 1. Inflate your balloon at a party store or by using a personal helium tank. 2. Cut a piece of tulle large enough to cover the balloon. Note that I used a rectangular piece of tulle that I had on hand and it wasn’t long enough to completely cover the sides of the balloon so it lays more loosely on the balloon. 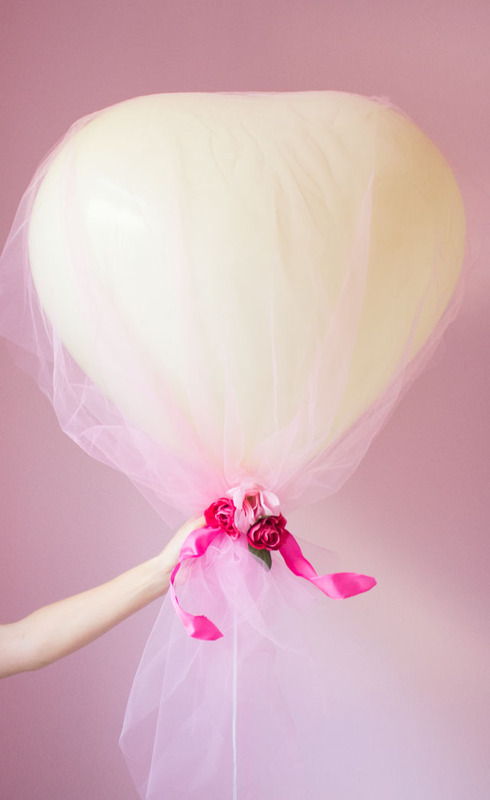 If you want the tulle tight against the balloon, cut a square that covers the entire balloon evenly. 3. 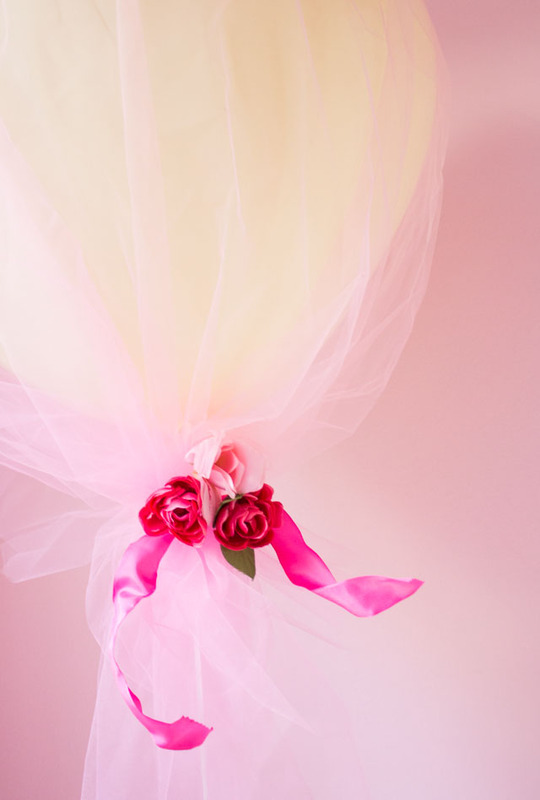 Hold the tulle in place at the base of the balloon by tying a pretty ribbon around it. If you want, you can add some artificial blooms with a small dab of hot glue! You’ll want to make these balloons right before your party. You can expect them to last at least 3-4 hours before starting to lose air and sink. You could also try giant mylar balloons as they tend to hold their air a lot longer than latex balloons!